Give ten minutes of your time and you might just save someone’s life. Just one of the messages on the agenda for World Blood Donor Awareness Day 2018. You don’t know them yet. In all likelihood you will never know them. But if you give ten minutes of your time you might just save someone’s life. Here’s how. Blood connects us all: not just a unifying truism, but the clarion call of World Blood Donor Day 2018. It takes place on 14th June and has two simple aims: celebrate blood donors; encourage future donations. In ten minutes you could empty the dishwasher. (Slowly.) You could have a quick snooze. Or you could potentially save someone’s life. Don’t believe us? It takes just ten minutes to give a pint of blood. And civilised medicine relies on the donation of the red stuff. That’s not preachy blandishment, but reality. 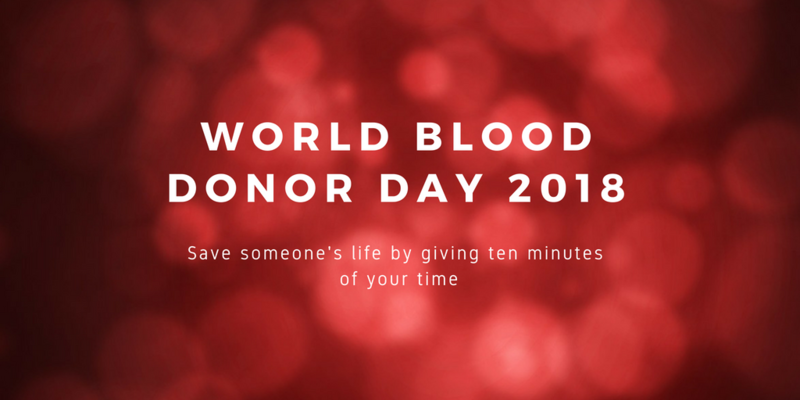 The transfusion of blood saves millions of lives every year. It helps patients involved in complex surgical procedures. It helps the emergency response to road traffic accidents. It helps to sustain life after acts of terrorism and natural disasters. And it’s not just about the patient that your blood saves. Each patient also has family, friends and colleagues. A ten-minute act of generosity goes a long, long way and impacts dozens of lives. Giving blood isn’t easy. Perhaps you are scared of needles. Maybe you are a little squeamish. It’s okay. Lots of people feel that way the first time they give blood. The important thing to know is that you are in safe hands. Once you get over the psychological barriers it’s as easy as sitting back in a comfy chair and contracting your arm a little. It goes without saying that the needle and bag used to collect your blood are single-use only. And what’s really gobsmacking is your body’s ability to replace the blood you donate. Give or take, you have ten pints of blood in your body. It makes up about 8% of your total bodyweight. Losing a pint of blood may sound drastic. But your body quickly gets to work to make up the deficit. Thanks to peritubular cells in the kidneys your body rapidly begins upping the production of brand new red blood cells. In fact, your body is capable of manufacturing two million red blood cells every second. Mind-blowing, isn’t it? Some donors feel a little faint or woozy after donation. But with good hydration (half of what you donate is made up of water) and healthy food you are unlikely to feel any side-effects. If you feel you’d like to help support medicine and potentially save a life, visit blood.co.uk. You will find everything you need to know and more. What else can you do in ten minutes? Protect your savings in case you are unexpectedly forced out of work due to illness or injury while building a financial nest egg for your future. Curious? Come this way.